I am very lucky to have seen the media world from various angles; working for over a decade in media sales starting with computer magazines through to digital display, affiliate and email; then spending 7 years planning and buying online media at agencies, and finally ending up where I am now, doing digital marketing contracts within client organisations. The journey has taken me a long time, but as a result I now have some pretty good insights into why you should or shouldn’t use an agency and also what it’s like to walk in the shoes of those involved. My main take out has been that we will all do our jobs better if we understand more about the context in which our internal and external partners work; and it is for this reason that I’ve previously summarised The Top 5 tips for Selling Media to Agencies. To continue with the theme, with a few more months experience working client side, today I give you The Top 5 Agency Tips to Keeping A Client Happy. Each time you take on a new client, a new product or campaign within an organisation, your most important priority is to set the goalposts. There is no point working painstakingly for weeks on a campaign that builds reach and frequency if the client (or the client’s boss) is only going to ask “How many sales did we make?”. Similarly if you are able to report on digital sales only, but don’t get to see offline or unattributed sales fluctuations you may be seriously hampering your campaign’s performance and under or over reporting the impact it has on the client’s bottom line. And the bottom line is always the bottom line. I have yet to find a client who doesn’t end by judging their media by the financial impact it has, nomatter how much they say they want to be innovative and “go beyond the banner” and have cut through and win awards. It’s money, plain and simple. You can make your life even easier by putting this one figure at the top of your report each day/week/month. Why make the client scroll through lines of data when the only figure their boss asks is “Are we up or down?”. Give them that figure at the top, big and bold with context (week on week, month on month, year on year), and then explain more later. Don’t make them search for it. if your job is to provide the client report on Monday by 10 O’clock, DO IT! Don’t wait till they natter, don’t think you’ve got a few hours leeway if they don’t seem to have noticed. That time will have been set for a reason – they may have a sales or board meeting at 11 where they will be asked about the figures. If they’ve been stuck in another meeting until then, and are relying on you to have sent the data through so they can access it on the fly, do you want to be the person who makes them look stupid in front of their board? If there are operational reasons why it’s difficult to get the data to them at that time – the ad server hasn’t updated sales, the report is bespoke and complex and can’t be done that quickly – then sit down with them and ask them what they can get away with. Many a time I have sent a client simple preliminary data (with caveats) only to follow up later with more mature data with a full analysis. Believe me, when the report lands in their inbox your client will breathe a sigh of relief because NOMATTER WHAT IT SAYS, some data is better than radio silence. Resource pressures allowing, try to always give them more information that the basic SLA states. If you show interest in their business and show examples of something relevant that another client has done, some media developments as a stimulus or do a bit of extra digging in competitor trends for some context, they will be nothing but happy. This point really matters when the client comes up for pitch, as you can guarantee that the other agencies will throw all sorts of innovative solutions at them to show the difference they can make, and the last thing you want is “Well, we stopped sending you ideas as you always said No.” to be your excuse when they mark you down and you lose the pitch on innovation. EVEN IF THEY SEEM TO BE TOTALLY INSANE do not insult the decisions they make. 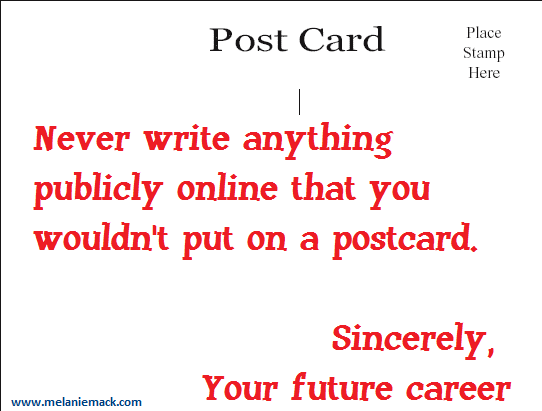 By all means ask questions about them, state (politely) why you may have done things differently and make caveats in your forecasts where you think these decisions will impact negatively on the performance metrics that you can see, but it is the height of arrogance to assume that you know their business better than them. You may know media, you may know how to get people to their website, but you are probably not seeing a whole pile of data that gives an entirely different context to performance. An example of this is using ad server/search tool data as gospel. Recently I had to stop an agency from continually over optimising an account, reducing potential lead volumes based on AdWords data, when the data of record for the company was the Google Analytics integrated search CPA, which was much healthier and meant that rather than reducing spend/bids, they could have been a lot braver. Had they been given access to the data? Yes. Did they bother looking? No. Did they send a report that criticised my decisions based on their incomplete data? Yes. Will they remain our supplier for long? No. Sometimes things go wrong in business and marketing. Products fail or get bad PR, messaging doesn’t create any impact, a competitor launches a spoiler. Recessions happen. Sometimes it’s the media choices, season, targeting or forecasting. Sometimes you just don’t know. But there is ALWAYS something you can learn from a campaign. Even if that thing is “We won’t do it again in that way”. There is nothing more depressing for a client to receive (or, I imagine, an agency account manager to write) than a post-campaign report where the results have fallen far short of the forecast or target, especially if there’s no obvious explanation; but you can rescue the wreckage by highlighting ways that other clients have improved things when faced with a seemingly dismal failure. One way to change the way you put things in context is to always to have 10% of your budget allocated to testing new things (especially in the ever changing digital world). This means that any test that fails is not seen as the end of the world, and instead a fundamental part of the development process. If you call it a test and it fails, it’s a learning. If you call it a plan and it fails, it’s failure. I know which one I’d be happier to discuss with my client/boss. Data. We’re all drowning in it. And the data you send to your client will be only a tiny part of the data they see each day. Digital media’s very trackability is the reason it remains the healthiest part of the advertising market (granted, it is also a stick with which it can be beaten). The result of all this data can be inertia as we all struggle to put it into context and gain anything actionable. This is where you can make your client look like a superstar. Good or bad are all relative concepts, and it is your job to take your client from data driven inertia to the “So what?” – think about what it means. How different is it to what you expected – AND WHAT DO YOU RECOMMEND THEY DO ABOUT IT NOW? Give them potential actions to take to their boss, even extreme ones to get them thinking. For every campaign learning, there should be a recommendation that the business can do to either capitalise on it, or avoid it in the future. State these and give your client an action plan to test these new recommendations (remember, tests don’t fail, they become learnings), and then you have a process of constant testing and learn, that WILL lead to success over time. This entry was posted in Advertising Agency, Media, Media Owners, Media sales, Paid Search and tagged advertising, agency, business, ient, internet, marketing on 05/06/2013 by melmackuk. Last week eBay threw its gauntlet down by publishing its internal study which found paid brand search advertising “ineffective” (to the point of negative ROI) and non brand search to have a very small impact, and even that only on the least valuable customers. I wouldn’t be overly concerned for Google’s share price. This is just the latest sabre rattling in the SEM market between one of the world’s biggest search advertisers and the dominant supplier (Google) who given their 80%+ share in most markets, and their resulting ability to ‘make or break’ a business are seen as a “frenemy” by many clients and agencies. Proving ROI for the wide area of non-brand search and the rest of digital is a complicated issue, which I discuss in more detail in my post on digital measurement and attribution, so I’ll save my comments today for the issue of “brand” search and how to tackle it. Once upon a time search terms like these were offered some protection by Google’s Trademark policy, meaning that trademark owners could register as such with Google and prevent anyone other than themselves (and their chosen list of resellers/affiliates) appearing in the search results. Most weeks at agencies we’d spot a cheeky affiliate bidding outside office hours, trying not to be caught; or receive a furious call from a client who’d seen a competitor seemingly bidding on a brand term. We’d dutifully report the instance and send a screenshot to Google and then wait impatiently while they were hopefully removed. It was a constant round of chasing and frustration, and took up a lot of our time. Google had an entire team of people dedicated to checking and implementing the restrictions, although the offences weren’t always as clear cut as they may have seemed. An advertiser whose brand name included a “generic” term could find that competitors ads would appear against their results through a process called “broad matching” – so “Toys R Us” may trademark the whole search string, but they couldn’t stop competitors appearing who had bid on the term “toys”. Lots of work for all involved, with the added issue for Google that if advertisers could protect their own trademarks, they wouldn’t have to bid on them, so Google made less money. So guess what Google did in 2007? They removed the trademark protection policy for keywords (it still applies for ad text – so you can’t say ‘We’re better than competitor x’ or ‘We sell iPods’ if you don’t), which made everyone panic and assume there’d be a free-for-all as soon as all advertisers could bid on each others’ brand names. What had been underestimated was whether it was going to be commercially viable to bid on competitor terms or not. Given that the more relevant a keyword is, the lower the cost (I’ll expand on Quality Score also at a later date) competitor terms tend to have a higher CPC than your own, so each advertiser has its own ROI metrics to decide if competitor bidding made sense for them or not. Not quite the panic that was predicted (Y2K anyone?) but even without competitors muddying the water, whether or not to bid on your own brand is just about the most frequent question that still occurs across paid search. If they’re looking for me anyway will they come to my site even if I don’t appear in the paid search results? Can I turn off my brand search terms and either save the money or invest it in other keywords or channels that will provide me with incremental traffic and sales? The answer is …. yes occasionally. But this applies to only a very few advertisers …. and it depends on various things. The single most important factor in making this decision is where your listings appear in the natural (organic) results. 70% or more of all clicks on a results page are on the natural search results, so your potential traffic is limited if you’re not appearing. Page 1 in natural? Test brand search on/off across similar seasonality and track combined search plus direct-to-site traffic levels to see the impact. It can go either way, and it can differ depending on your offline marketing activity/seasonality. Page 2 or later in natural? You may as well be invisible. Use PPC to ensure your potential customers find you. This dominance serves both a practical and a branding purpose. 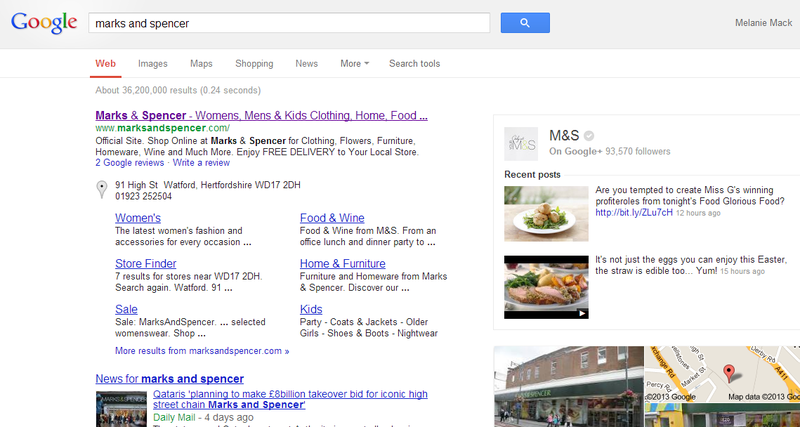 The searcher is offered very few other choices other than to click through to the M&S site; plus they are reassured that they have come to the right place with stimulating social content and useful location information that should help both their online conversion and possibly drive store visits too. As we’ve seen above, there’s nothing but cost to stop your competitors bidding on your brand name, so the levels of aggressiveness in your marketplace will have a huge impact. Some clients will pursue a disruptive strategy to buy market share even if it isn’t profitable at first, in order to either gain future sales from those customers. The issue is that with online, everything is easy. It’s not like the offline world where a customer walks into a showroom and then has all the glossy cars and the smell of leather to seduce them, or the fact that it’s a faff to get the kids in the car and drive to the other luxury car showroom to make them stay. All they have to do is click a different link, and the competitor has just as high a chance of sending them a brochure/developing a relationship with them as you do. Of course people develop emotional relationships with car brands, as they do other high involvement purchases, but there will be many who have a shortlist of more than one brand – and do you really want to take that chance? The UK insurance market is cluttered and competitive, with many well known brand name insurers, plus the price comparison sites – many of which are now brands in themselves. 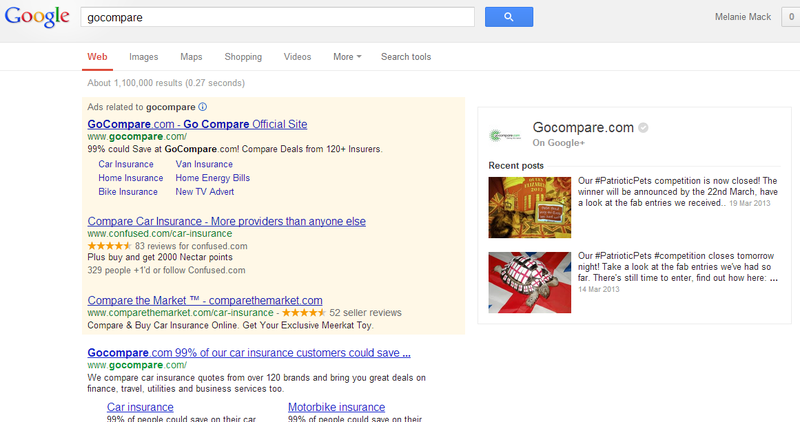 The search above is for the brand name derivative “gocompare” – and in this instance you can see that the competitors Confused.com and Compare The Market are bidding on the brand term, which dilutes the dominance that they would otherwise gain from their successful natural search results, and the Google+ page. Confused and Compare The Market won’t do this for fun – they do it for hard nosed economic reasons, and it must be worth their while to pay the higher CPCs their competitor terms will demand. To me it shows that where the products are homogeneous (and/or price elastic) then searchers are highly likely to be tempted elsewhere even if they have expressed a preference in their initial search. Where your market is aggressively competitive, always bid on your brand term, and consider using ad text stating “official site” to give people reassurance and prevent last minute leakage. Consider a joint search strategy with your resellers and affiliates to help you to dominate the brand term space. You will lose some margin but prevent the click going to an outright competitor. One of the main differences between paid search and SEO activities is the speed with which you can see results, and for this reason you may consider continuing to use paid search for campaign driven activity, even if an “always on” approach doesn’t pay dividends. Natural search results are something that take a long time to build. They are based on the authority, readability and quality of the content on your site and as such, shouldn’t be messed around with for a short term gain. The last thing you want is your natural search results saying “Sale On Now!” when it in fact ended weeks ago, as this is a bad user experience and will mean customers do not believe you the next time. For sales, new product launches – any communication that differs from business as usual, then PPC is the ideal channel. 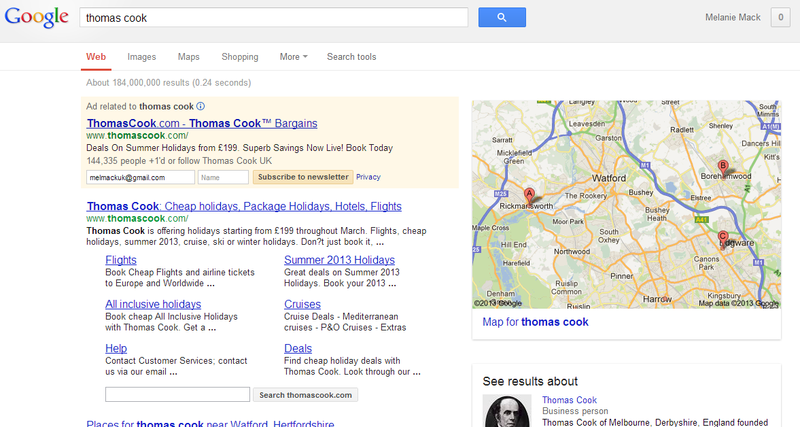 In this example, Thomas Cook have great natural search positions, location results, Google+ and comprehensive natural sitelinks, but still choose to run paid search ads to promote their summer holiday deals, and to capture email addresses for future eCRM activity. If it’s worth running a campaign in offline/other media, then it’s worth repeating in PPC. Increasing dual and triple screen usage (TV, tablet and phone) means that TV spots times are immediately mirrored by brand search trends. Spending millions on TV only for people to get lost whilst looking for that promotion online is a leaky bucket directly to your competitors. Don’t stimulate demand and then fail to scoop it up. Phone Book versus Yellow Pages. The examples above have been for e-commerce sites and concentrate mostly on acquiring new customers, but one enormous factor that causes resentment amongst marketers is having existing customers click on the paid search link, when they are visiting purely to log into their account, interact with customer services or heaven forbid – make a complaint! Most advertisers that have long term customers avoid using brand PPC for exactly this reason (have a look at British Gas, O2, Tesco, Barclays Bank for instance) and as long as their natural search is healthy, this isn’t the end of the world. It is a bit like having the free listing in the phone book or Yellow Pages, you’re there, you’re findable but aren’t going to get the customer particularly excited. One thing to bear in mind for this approach is that your homepage will need to be easily editable with campaign information, to ensure that any campaigns that do get run elsewhere can easily be followed through rather than lost in the usual clutter. If you have 6 month code release windows, you may wish to run a PPC campaign rather than fight with IT. A special mention should be made here for those who continue to advertise heavily in brand PPC with a standard message even with strong page dominance, such as Ladbrokes, Sky TV and Expedia. Either way, they have their reasons and as in most marketing decisions, it’ll be a blend of hard numbers, branding, a bit of finger in-the-air and “the boss likes it”. This entry was posted in Google, Measurement, Paid Search, Search, SEO and tagged compare the market, confused, ebay, expedia, go compare, Google, ladbrokes, marks and spencer, ppc, search, sem, seo, sky, thomas cook on 19/03/2013 by melmackuk. Having been in the media industry for *cough* 20 years this year, the scales fell from my eyes a long time ago. I assumed that everyone approached media and advertising with the same slightly raised eyebrow as me, so when people who don’t work in media (and hence probably do real jobs) express righteous anger at Facebook redesigns, their dwindling sense of privacy or misguidedly share one of those annoying “I hereby do not give you right to do blah blah…..” notices I am genuinely surprised that some people really haven’t figured it out. For the avoidance of doubt, Facebook is a commercial entity, as is Google, as is ITV. They are not publicly funded like the BBC, therefore their sole reason for creating ANYTHING is to make you use it and watch it – so that they can sell advertising around it. In addition to that, they can get more money for their advertising if they know more about their audience (yes, that’s you). To give an example – imagine that Disney are selling their new animated kids’ movie. They may be willing to pay a certain amount for their ad to be seen in front of a thousand people. If those people can be proven to be parents, then their perceived value of those eyeballs grows. This makes the newspaper/magazine/TV station/website publisher much happier, and gives them an incentive to find out as much about you as they can, to increase your value to their advertisers. If there is even further information available about viewers/listeners/users, such as the age of their children, whether they’ve liked other Disney animated films and if they’ve visited one of the Disney Parks in the last 12 months – that value can further grow enormously as it’s a good indicator that they’re more likely to buy the advertiser’s product. For the basic UK adult targeting above, Facebook recommends a CPC (cost per click) bid of between 25p to 54p, How much of this you’ll have to pay will depend on how fast you want to spend your budget, and supply and demand at the time you go live. 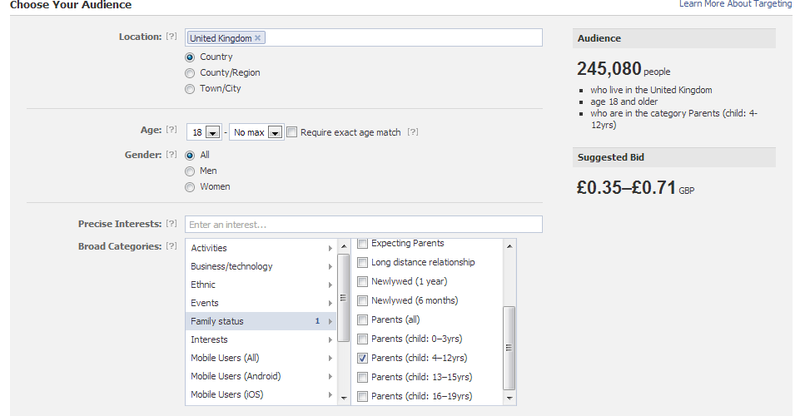 Facebook audience targeting with children aged 4-12. As you can see, the number of people in the target audience has dropped (to less than 10% of the original number), and the price you’ll have to pay to show them your ads has increased, by about 30%. If these people respond more frequently to the ads and therefore the advertiser sells more DVDs, then it’s evidently still worth their while to pay a bit more, so everyone’s still happy. But how much do they really know about me? Well traditionally “brand” advertising has been sold around content, so you’ll see different ads around America’s Next Top Model than you do around Wheeler Dealers. The assumption is that certain types of people (gender, age bracket, purchasing habits) trend towards certain content. Direct advertising, and especially since the growth of the internet is more likely to be sold around what we know about the person themselves. The 80s saw the launch of ACORN (A Classification of Regional Neighbourhoods) in the States, which segmented all US areas into demographic types – which was used to help advertisers to accurately target their direct mail and later TV, and now online across most countries. Clearly people living in areas classified as “02 – Affluent working families with mortgages” will be worth more to the advertiser than “48 – Low incomes, high unemployment, single parents”. It has ever been thus and means that where they can, advertisers will use the most detailed criteria available to increase the response to, and decrease the wastage of their advertising activity. There are so many targeting criteria that can be used to target the Facebook audience, and all these options make the audience more valuable to the advertiser (and to Facebook). 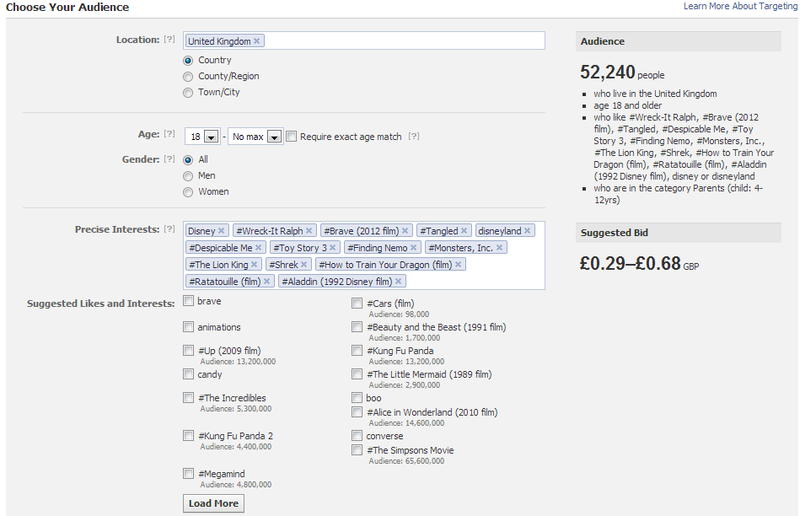 Disney films, parks and characters can be added to the interest category, and these people set up as a segment so that they will see the ads that are most targeted to them. If the advertiser wanted to target grandparents also – say in the run up to Xmas, they can add extra age criteria to make it more relevant and tweak the ads even further.There is a segment called “babyboomers” who can be lured with nostalgic references to childhood toys of their youth. Those who see the level of detail advertisers can access for the first time often react with horror – OMG!! They’re going to sell me stuff!! b) at least the stuff they’ll try to sell you is vaguely relevant. I’d be very bored very quickly if all the ads I ever saw were for golf equipment and incontinence pads (neither of which I have a need for, incidentally). If you feel worried about your privacy then there are always ways you can prevent advertisers from knowing more about you. Go and live in the desert, although you may just end up re-classified as “Self sufficient, rejecter of society, interested in green issues”. This entry was posted in Digital display advertising, Facebook, Google, Media buying, Media sales, Targeting and tagged acorn, advertising, cpc, Facebook, Targeting on 13/03/2013 by melmackuk. Is there really a need for SEO? SEO sort of snuck up on me. With a background in paid and performance media – first display, affiliate and then paid search; it took a while for me to feel comfortable with the often unpredictable effects of SEO activities. With display or paid search, you have an obvious cause and effect. Pay for the media, it’s shown to targeted users (or self selecting in the case of PPC) and they respond, or not – based on the offer, the competitive market and how well your site and product mix satisfies their information or purchase needs. You can then judge the efficacy of each part, and choose to do more or less of certain elements of your campaign. SEO seems to be the discipline most shrouded in secrecy – at least for those whose background didn’t start there. It reminds me of the accepted stereotype in 90s IT publishing years, where the clever, geeky (well before geeky became cool) slightly socially inept bloke from ‘systems’ would come down the corridor bearing a stack of green & white striped listing paper with reams of data on it, to confuse the sales, marketing and financial management with acronyms and talk in seemingly an entirely different language. Things have moved on, not just because of ITs ubiquity and accessibility on the desktop but I still suspect that many people, wittingly or not, over complicate technology in order to maintain an air of superiority (and possibly also their high consultancy fees). SEO seems a lot like this as words like “robots” “metadescriptions” and “algorithm” get bandied around and confuse the marketing team into paying for some magic fairy dust that will convince the mighty Google to bend over and put your site where you think it ought to be. The reality is that many marketers pay large amounts of their budget on SEO but the results are not immediately obvious. Sometimes work can take weeks or months to make an impact, and sometimes is justified in terms of the opportunity cost of not doing it “your rankings could have slipped to here if we hadn’t been doing x or y”. In an increasingly KPI driven world, it’s hard to compare the cost of driving/maintaining traffic from a fee-based SEO service with the cost of incremental campaign traffic from your performance campaigns. Often it’s run by different teams in a client company, and definitely by different operational teams in an agency, which means that too often the integration benefits are overlooked in favour of a competitive us-and-them attitude. There are of course core fundamentals to good SEO, at which point I humbly refer to the bible of search, Search Engine Land, who have a fantastic infographic showing the factors that influence a site’s ranking, that any SEO worth their salt will live and breathe. Try to link to and from other good relevant sites that will help people to find more useful information. Clue: if a user would like it, Google probably will too. This will also mean that the user will share it which will give Google the social signals that are increasingly impacting how pages are ranked (in both natural and paid search). As all of the above things are what your website team should be doing anyway, then doesn’t that mean that there’s no need for SEO at all? The answer sadly, is no. Website design and development is a long, iterative process, and it’s rarely possible or even advisable to throw an entire site away and start from scratch in an SEO friendly way. Apart from anything else, even if your site isn’t the best one, the length of time it’s been there will give it some authority so there is always a risk with changes even on a long standing domain. The way that the Google algorithm ranks pages is also constantly updated, so what works well at one time may be less relevant in a few months time, or you may find there’s something new that is being taken into account. For years using a flash site was seen as SEO hell, and in some cases it’s still not a good idea, but there are now ways to ensure that the text content can be read and Hey Presto, users like it, and so does Google. Some months ago I was lucky enough to attend a presentation at the shiny Google London office from Amit Singhal (@theamitsinghal), one of the original architects of the Google algorithm. I was impressed by his passion that users should be able to find the most relevant content, quickly and efficiently (with seemingly no care for whether Google could monetise it). True to this belief, the updates that happen to the Google algorithm are always meant to improve the quality of the overall search results. You may for instance have heard of Panda, which started in 2011 and is a rolling update meant to remove “thin” content from the results pages (hence preferring sites with substantial deep content). The best way to maximise your chances of appearing in the search results page is to apply best practise SEO principles for the site structure, linking architecture and labelling conventions in the first place. If you haven’t done this already then any good SEO can tell you which are the key things to edit that will make a difference. One the structural issues are dealt with, the best way to build and maintain rankings is to continually improve your site, and make the content deeper and richer – thereby more valuable to users who will visit it, share it and link to it more, which will all help you too. And a final reminder to avoid any of the “get high quick” schemes. Any SEO that guarantees rankings or makes an unexpected big jump in a short space of time is probably doing something that Google will find out about and penalise. Global brands like BMW and Interflora have been de-listed entirely from Google before for violating their policies, so it is just NOT worth thinking you can swerve the big G.
This entry was posted in Google, Search, SEO and tagged Google, ppc, seo on 27/02/2013 by melmackuk.